Sir Alex Ferguson says Manchester United face the "biggest derby" of his Old Trafford career after blowing a 4-2 lead against Everton. Wayne Rooney scored twice on Sunday but Nikica Jelavic and Steven Pienaar's late strikes boosted Manchester City, who relegated Wolves with a 2-0 win. If Roberto Mancini's side beat United next Monday, they will go top on goal difference with two games remaining. 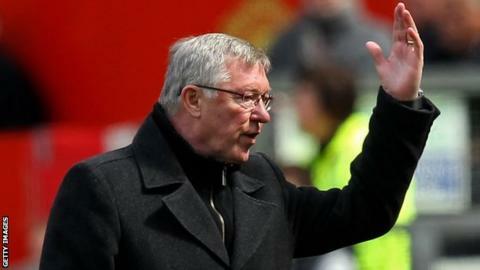 Ferguson said: "We need a result. It's a derby of amazing proportions." In the opening Premier League meeting between the Manchester clubs in October, City claimed a famous 6-1 win against a 10-man United. He added: "It is probably the most important derby game in my time. We have to go there, make sure we perform in the right way and not give away silly goals. "There's no reason why we can't get a good result. There has been an expectancy from City that this could be their decider, but it's our decider too." Ferguson said he was mystified by his team's defensive lapses as Rooney, Danny Welbeck and Nani were all on target in a thrilling game. But having established a 3-1 lead, Marouane Fellaini made it 3-2 before Rooney got his 33rd goal of the season to appear to make the game safe. Everton then struck twice in two minutes, with Pienaar's leveller coming five minutes from the end. It also overshadowed a day when Rooney moved to fourth on United's all-time goalscorer's list ahead of George Best and Dennis Viollet. "It was a throwaway, an absolute giveaway," Ferguson added. "We just needed to see the game out. 27 March, 1968: United 1-3 City - Goals from Colin Bell, George Heslop and Francis Lee hands City a crucial win at Old Trafford as they eventually pip United to the title by two points. 27 April, 1974: United 0-1 City - Denis Law's backheel cements his former side's relegation to the Second Division. 6 April, 1996: City 2-3 United - A Ryan Giggs goal at Maine Road keeps City near the drop-zone in a season that sees them relegated on goal difference. 10 February, 2008: United 1-2 City: Darius Vassell and Benjani score to give City victory on the 50th anniversary of the Munich air disaster. 12 February, 2011: United 2-1 City: A stunning overhead kick by Wayne Rooney hands United the momentum in their push to win a record-breaking 19th top-flight title. "It was a travesty because some of the football we played was fantastic and some of the goals we scored were great goals. To give away four goals at Old Trafford in a game that was so important, I just couldn't believe it. "We've given Manchester City the initiative. It makes the game at the Etihad a really important game, it's a decider really. "We've made it hard for ourselves as we normally do, but we have to go there knowing that we are capable of getting a result." Everton's comeback was a superb response after their FA Cup semi-final defeat by Liverpool. Although they did not manage to break a run of 20 years without a win at Old Trafford, boss David Moyes said it was a merited point. "We deserved everything we got," he told BBC Sport. "We went toe-to-toe with them and we tried to make chances. "We have reminded people we are still here. We are not a bad team. Since January we have been a very good team. "When you lose a semi-final against your local rivals it is tough to take. "But how many teams are going to get back into it from a position like that at Manchester United? "It will make next week's game at Manchester City a bit more tidy."